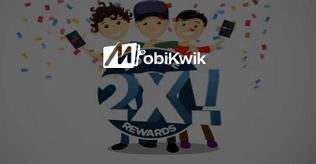 Mobikwik is back again withan 2X Refer & Earn offer through which can earn double referral money upto Rs.2000 Mobikwik Cash by referring your friends.Once your friend installs theapp and Adds Rs.100 or more on the App, your friend gets Rs.40 & you get Rs.40. Hurry Up! Avail the Offer! How To Get This Mobikwik Offer? • Now Add Rs.100 Into Your Mobikwik Account. • Make The Payment Via CC/DC.Now You Will Get Extra Rs.40 Into Your Mobikwik Account. • Per referral you will get Rs.40, your friend will also get Rs.40 once they join using your referral link & add Rs.100.